There are several ways you can optimize your article for better indexing and ranking in search engines. Usage of strong keywords and synonyms, the location in the text of those keywords and synonyms (i.e., in a title vs. only in a sub-heading)3, the completeness of the metadata, the use of vector graphics for your graphs and tables and having a public group for your research, are some examples of the techniques. Continue reading for more information on how to implement these and other techniques. Write a good and short title for your article. If you can use one or more keywords in the title while accurately describing the content of your article, then do it. Keep in mind the audience of your article and any academic keywords specific to your field to inform which keywords may be best to use. In addition to the keywords tool from Google, check out Google Insights and Google Trends. With the latter two, you can see the popularity of keywords over a period of time and by geographic location, which may or may not be relevant for you and to your article. Until now, Google offers the most tools for SEO. Don’t go overboard with using numerous top keywords in every location of your article. You want to tastefully optimize your article without compromising the relevance and quality of your writing and research. The metadata of an article refers to a number of things. Metadata can refer to keywords used, as well as to the type of file your document is, such as whether it is a PDF or Word file, the title, subjects and authors of the article, the date of the article, the name of the publisher and more. The metadata of your article also factors into the indexing and ranking of your article, so you should ensure this information is complete. Citations are critical in the academic world, both offline and online. The more your research articles are cited by others in their articles, the better. Your visibility and reputation benefit from numerous citations. 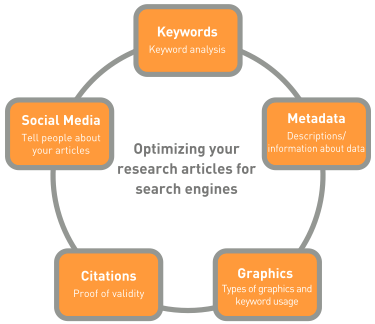 Accordingly, for SEO, the number of citations to your past and current research factors into the indexing and ranking of your past, present and future articles.10 Citations to your past publication within your current and future publications, as well as in the publications by other authors, are very relevant and good for SEO. Writing and publishing your scholarly article is not the final step. You must inform everyone in your academic and social networks about it as well. Create a public group for your article or research in any number of places12, share links to your abstract or publication onAcademia.edu,LinkedIn, on your website, your academic institution’s profile page,Facebook, Twitter , etc. Also, include the publication in your institution’s repository, onMendeley,ResearchGateand elsewhere. Beel, Joeran, Gipp, Bela and Wilde, Erik. “Academic Search Engine Optimization (ASEO): Optimizing Scholarly Literature for Google Scholar & Co.”; and Hoyt, Jason. Mendeley blog. 29 November 2010. Academic SEO – Market (and Publish) or Perish. SEO Administrator. SEO Tutorial-SEO Tips. Vector Image File Types. (last accessed 24 August 2012). Hoyt, Jason. Mendeley blog. 29 November 2010. Academic SEO – Market (and Pub- lish) or Perish. I have written a short article " Ale Ebrahim, N. (2013). Introduction to the Research Tools mind map. Research World, 10, Article A10.4. Retrieved from http://www1.ximb.ac.in/RW.nsf/pages/A10.4", in the fourth section (Enhancing Visibility and Impact, I explain about some tools which can assist the research to improve their citation index.